Yarls Wood Befrienders held their annual conference on Saturday 26 January 2019 at the Forest Centre in Bedford. 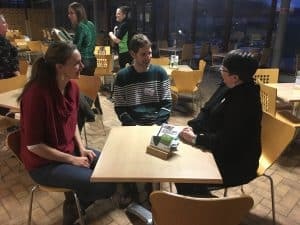 It was a chance for volunteers who befriend vulnerable women at Yarls Wood Immigration Removal Centre to get together, reflect on their work and learn more about immigration detention. Tim Davies and Helen MacIntyre from Wilsons’ immigration and public law departments respectively presented the afternoon sessions. Tim spoke about immigration bail and the law and procedure around removals from the UK. Helen gave an overview of unlawful immigration detention law and compensation claims. Wilsons are very pleased to support this excellent organisation and the fantastic work that they do for immigration detainees.